Pleasing your kids could prove a difficult task, especially since there are countless toys, beds, and accessories to choose from. So, if you’re looking for some awesome gifts for kids but you’re not really sure which ones to choose, we have some suggestions for you. Each of the selected items will help provide a safe environment for your kid to sleep, take a nap or play. In addition, all the beds and tents are specifically designed for children and their needs, so they are 100% safe to use. The product is available in four different patterns to resemble famous animation productions. The Lightning McQueen design is perfect for toddlers who love Pixar’s “Cars” animation. The bed is built with a strong and sturdy wooden frame and meets all JPMA safety requirements. It is recommended for children ages 15 months and older and is easy to assemble. The item also features two high side rails to make sure your child sleeps safely and he or she won’t fall off the bed accidentally. Moreover, it is suitable for toddlers and children who just transitioned from sleeping with their parents to sleeping in their own bed. For children who love the “Thomas” animation, this bed is perfect. 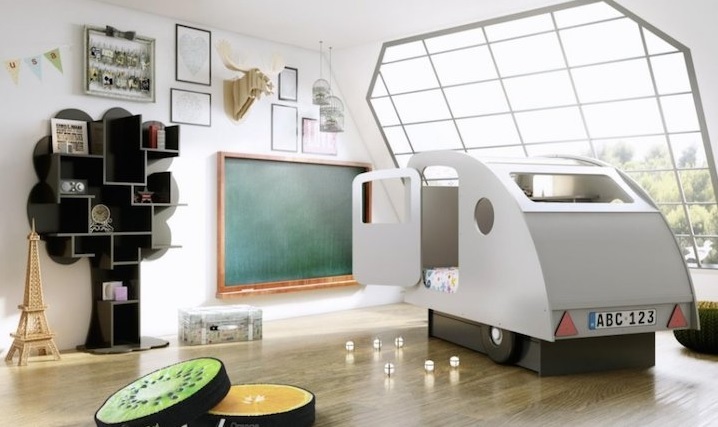 The train-shaped bed is the perfect accessory for a good night sleep and, thanks to the innovative and colorful design, it will stimulate your child’s imagination. This bed is ideal for toddlers and comes with a storage compartment behind the smoke stack to keep your child’s pajamas, pillows or some toys. The product is easy to assemble and comes with all necessary instructions. The wooden frame can accommodate a standard toddler crib mattress so your child could easily transition from his or her crib to an “adult-like” bed. This twin loft bed is perfect for little brothers or sisters who want to sleep together and play together all the time. It is also great for children who need more space when sleeping. The bed features a fun camo tent fabric to provide a safe playground for your children. The height of this tent bed is approximately 29 inches from the floor to the bottom rail and comes with a wooden frame that is easy to assemble. It is perfect for toddlers and little children but the design allows additional cross beams so you can increase the maximum weight limit as your child grows older. If you truly want your child to feel special, this camo tent is perfect for a good night sleep and endless hours of fun. The product is made of sturdy steel and styled to an army theme, perfect for young explorers and those who love nature and outdoor trips. The bunk bed is completed with a side ladder for easy access, as well as an underneath tent and a fun slide. The tent is large enough to provide a comfortable and unique playground for two-three children and can also work great as a storage deposit for toys. It is designed for children age 6 and above and the maximum bed weight is 400 pounds. This toddler bed comes in three unique designs for both girls and boys. The Ninja Turtles design is colored in shades of blue and green and will represent the perfect transition from cribs to regular beds. The bed holds up to 50 pounds and is recommended for toddlers aged 15 months and above. It features two attached guardrails to prevent your baby from falling off the bed during the night and uses a standard crib mattress. Also, the product is made of a solid and sturdy steel frame and requires some easy assembling. If you’re looking for a space-efficient solution to accommodate two siblings in the same room, you should definitely consider this double bed. It is designed to last, uses eco-friendly hardwood, and comes with five protective stairs that also work as convenient storage deposits. The staircase can be set as an additional bed for those who love sleepovers. The product requires assembly and all the mattresses and bedding are sold separately. Nevertheless, this looks like the dream bed for both boys and girls as it is equipped with full beds and plenty of places to store books, clothes, toys or pillows. This bed is perfect for little girls who want to live like princesses or fairies. It provides more than 28 cubic feet of storage place, enough for pajamas, bed night storybooks, and your great kids’ toys. The product is made of a sturdy and reliable plastic construction and features a center ladder that provides easy access on and off the bed. The item accommodates a standard twin-size mattress that is sold separately. Also, it requires some assembling but you can easily finish up putting the pieces together in no time. The bed is large enough and will provide a safe sleeping and resting environment for your daughter. This magic bed is suitable for girls of all ages who want to feel like princesses. The white low loft wooden construction perfectly compliments the pink fabric of the tent to provide a true magic appearance. The bed is equipped with a large storage area underneath as well as with a generous play area in the form of a tent. The tent can be sealed to provide intimacy for your little girl and her friends while playing. In addition, the bed also features a sturdy white ladder for easy access to the sleeping area and a bed frame for a standard double mattress. Those who prefer the classic Disney prints and cartoons can purchase this beautifully crafted Minnie Mouse twin bed. The product features an upholstered headboard for increased protection and comfort while sleeping and is made of strong and reliable wood. It is easy to assemble and fits a standard twin mattress you can purchase separately. Also, the product is designed for children over 3 years old and can make the perfect transition from a cradle to a regular bed. Most of the customers who purchased this Minnie Mouse bed were pleased with its quality and the fact that it is easy to assemble. 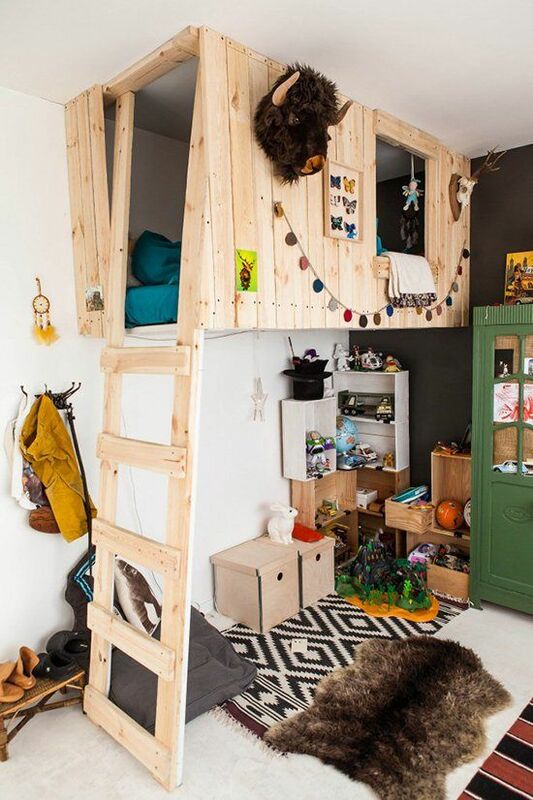 In our opinion, this is one of the coolest beds you can purchase for your kid. The pirate ship design will definitely transport your child into a world of dreams and adventures, stimulating his or her creativity and imagination. The design closely follows the shape of a pirate ship, complete with a pirate flag, life-like cannon balls on both sides, and a wooden ship deck. The bed frame is perfect for a standard single mattress and is delivered with a medium-sized spring mattress with cotton fabric. In addition, the product features a large storage deposit underneath so you can easily put your kid’s pajamas, toys or favorite blanket. When you choose a bed for your child, you have to pay much more attention than you would otherwise do when you would be buying one for yourself, and that’s because you have to concern yourself with the safety aspect. Beyond this, you’ll see that there are lots of different beds depending on style, sizes, comfort and so on. This means that you’ll have to waste a lot of time on research and pondering. 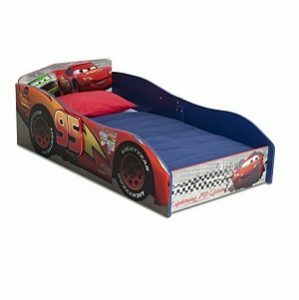 Do you remember when you were a kid and envied a friend of yours that had a bed that was designed to look like a race car? You can make sure your most loved one won’t go through this by choosing a fantastic looking bed that looks like a tent or a car or anything else that would make your otherwise active kid impatient to go to sleep. Luckily, you have found this article, and we mean what we say in the title. We’ll help you find the best kids beds because we did the research for you by looking through kids beds reviews found on the internet. Now all you have to do is get a cup of coffee and relax by reading what our busy minds found and put together in this comprehensive buying guide. Today’s market is flooded with plenty of products regardless of what you want. So if you don’t want to waste any more time on tiresome online research then allow us to intervene in order to help you acquire a good bed for a kid. After we read the reviews for the best beds for kids that are currently for sale we are confident you can find the product you need. If we’re talking about comfort, we’re talking about mattresses because they are one of the most if not the most important measure you can take in order to know that your kid will be able to sleep soundly throughout the night. Like the beds which need them, mattresses can be found in various types, including the classic case of soft or firm. Both types of softness have their advantages and disadvantages so make sure you know what your children want and prefer. Consider how tall your kid is and how much he or she weighs in order for you to properly assess the mattress size. Ideally, it should exceed your kid’s height by 2 to 4 feet. Regarding its firmness you can find two types in general, soft or firm. Again, you should let your kid try out the mattress and decide if it’s the right one for him or her. Its quality is almost always dependent on its price. Its market is flooded with options so you can choose anything from cheap to premium, as there are different ranges of mattresses. This time, don’t consult your kid, check your budget. As we already said, there are various types of beds from which you can choose. You can consider great bunk beds that consist of a bed being placed completely on top of another. The top bed can be accessed by a ladder that is tied to its construction. Usually, a bunk bed is available in wood or metal. Futon bunk beds are one of the most comfortable types of bed around because the futon which is on the bottom provides a lot of space to sit on, while the bed which is on top offers plenty of space for someone else to sleep on. They can be used in dorms too, apart from your kid’s bedroom. Loft beds are similar to bunk beds the only difference being that there isn’t a bottom bed. Instead the bed is placed on top of an open space that can be used for storage. Twin beds are ideal for rooms that don’t have a lot of space. Full beds or double beds are suited for taller, heavier kids. Canopy beds represent a traditional type of bed that is often suited for girls. Its tall posts can provide support for a fabric cover. Some of them come with drawers or a trundle below. There is a version that can be appealing to both boys and girls, and it is consisted of pencil posts but without a canopy. Consider the bed’s type of frame in order to make sure that your kid is sleeping safely. Safety should be the top priority when looking for the best children’s beds. Apparently, when we’re talking about beds everything about them can be found in a great variety, and their frames don’t make an exception. Some of them, like loft beds or bunk beds, are designed to sleep high off the ground, but it creates the risk of falling out of bed while tossing and turning and the chance of injury is quite high as well. Consider bed rails as they prevent injuries or just look for a bed that lies directly on the floor to eliminate any risks whatsoever. Be sure that the bed you acquire is perfectly suited for the room in which your little one is sleeping. If the bed is bigger than what your room can handle your child might begin to feel claustrophobic. The other case of it being too small might leave your child unable to comfortably sleep. So remember, keep the measurements of your room in mind while browsing for that desired bed. Since we’re talking about kids, you need to make those hours that they’re spending in bed quite enjoyable. That should be easy to do by simply choosing a neatly designed bed frame. If your kid a room with a certain theme he or she would love if the bed would be able to fit in. Also, if they love the bed, they would go to sleep without fussing over it. Of course, this kind of specifically designed bed tends to found itself higher up in the price range than other models that are more standard. But you may find that the benefits offered by its unique design can outweigh the money spent on it.